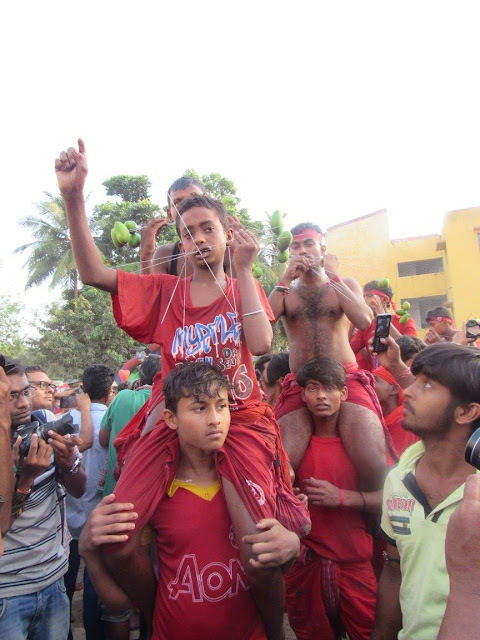 I was planning to see Gajon and Charak festival for a very long time. 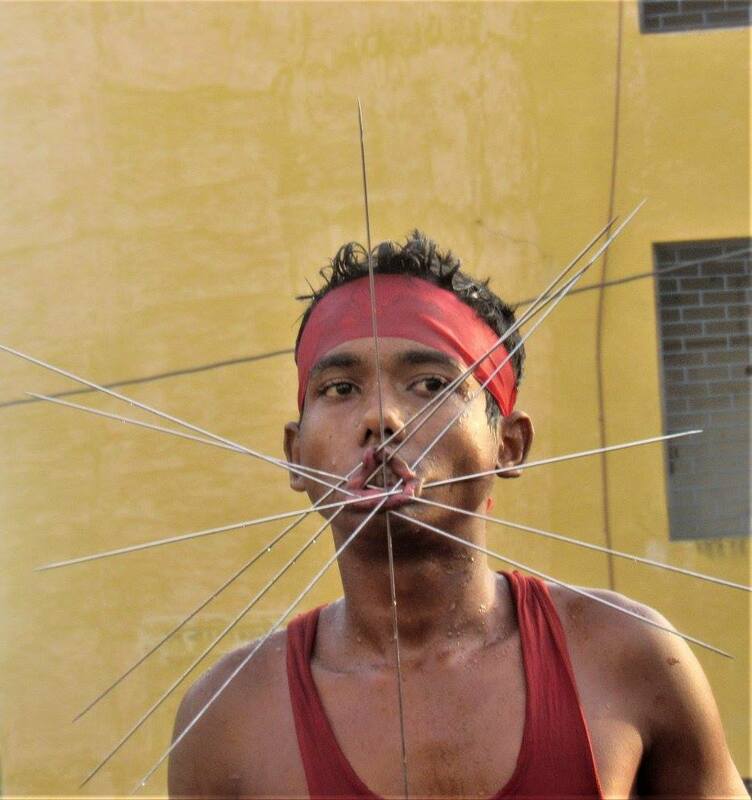 This year the day of Charak or Charok fell on 14.04.2017 - the day of Good Friday - which is my holiday ! 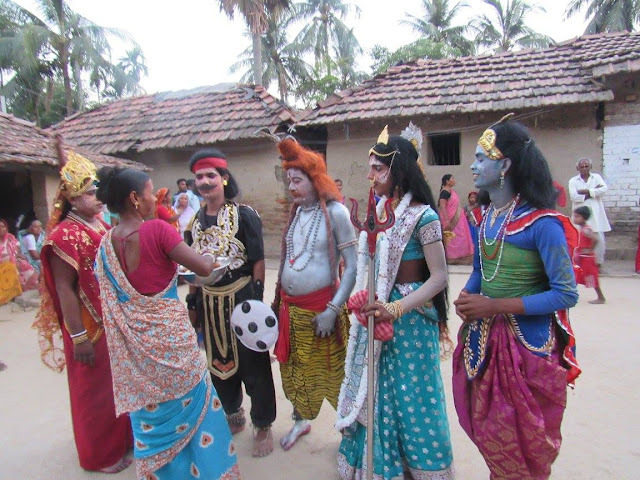 But probably the best one is being held at Baghnapara near Kalna - at Krishnadevpur High School, Burdwan. Our route by car is Kolkata - Dankuni - Singur - Gurap - Magra Gurap Road - Bhastara - Boinchi (but pronounced as Boichi) - Baidyapur ( but pronounced as Boddipur) - Sener-danga - Take left from Kalna Hindu Milan Mandir - Krishna-devpur High school. Take any local train going to Katwa from Sealdah /Howrah. Get down either at Ambika Kalna or the next stop Baghnapara. There is one more place where Charak takes place in Baghnapara. But do not go there. The main charak takes place in front of Krishnadevpur High school. It took around 4 hours for us to reach Baghna-para by SUV from Kolkata. We were just in time - we reached at around 4 pm. We were 7 in our group. When we reached there, it was full of photographers from Kolkata and even one from outside India ! 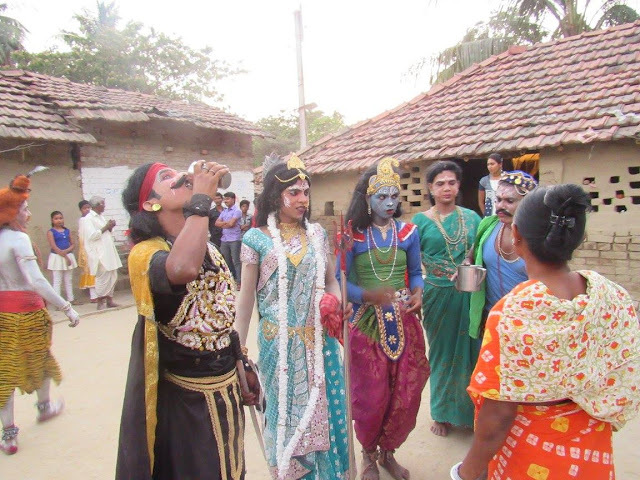 Gajan festival is associated with deities such as Shiva, Nil and Dharmathakur. Gajan spans around a week, starting at the last week of Choitro or Chaitra continuing till the end of the bengali year. 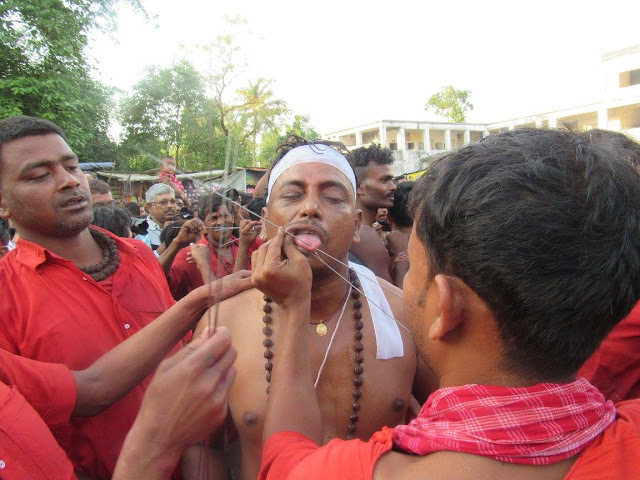 It ends with Charak Puja. 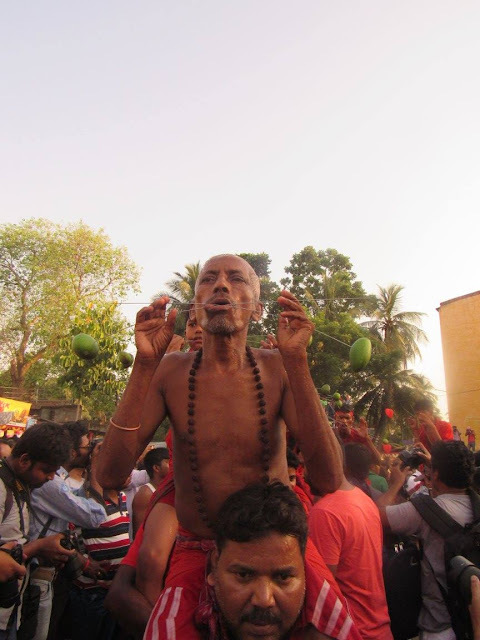 Participants of this festival is known as Gajan sannyasi or Bhokta. In Bengal Dharmathakur is generally worshipped by the scheduled cast like Bauri, Bagdi, Hari, Dom. Dharmathakur may have been originated from Dharmaraj of Buddhism. Although Dharmathakur is identified by a shapeless stone (as seen in Bankura) and its Vahana is represented by terracotta horses , there have been instances where Buddha idol has been worshipped as Dharma Thakur in villages of Bankura. There are still villages where both Dharamraj and Shiva are placed with Gajan offerings. Gajan is actually linked to persons who are related to agricultural community, directly or indirectly. They pray for the rains and better harvest. Lord Shiva is said to be closely related to this community. It may be worth noting here that Dharmathakur is actually considered to be the God of Fertility. Charak Puja (also known as Nil Puja) is a Hindu folk festival, held in southern Bangladesh and West Bengal on the last day of the month of Chaitra . Similar festival in Maharashtra is called Bagad, while in Vizianagram, Andhra Pradesh it is called as Sirimanu utsavam. People believe that the festival will carry prosperity by eliminating the sorrow and sufferings of the previous year. 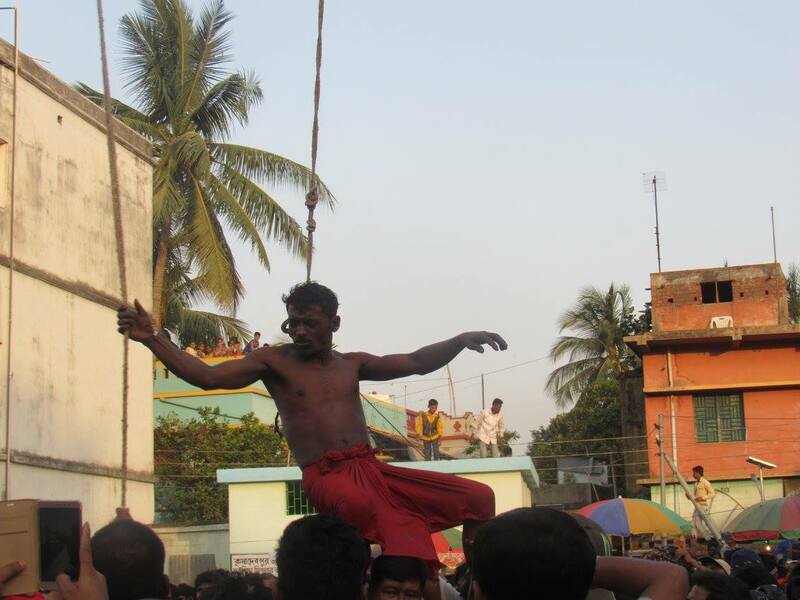 The festival is actually a festival to satisfy "Lord Shiva", the great "Debadideb" of Hindu Religion. Though the festival takes place on the mid night of Chaitra Song-kranti, the preparation phase usually starts before one month of the day. 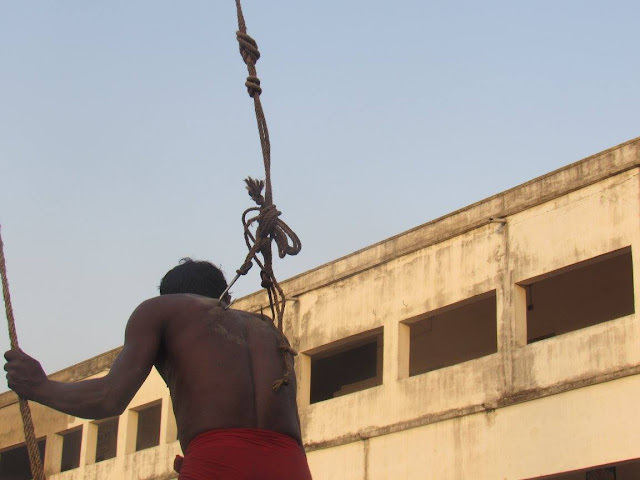 Chaitra Sankranti begins on 14th March of every year. 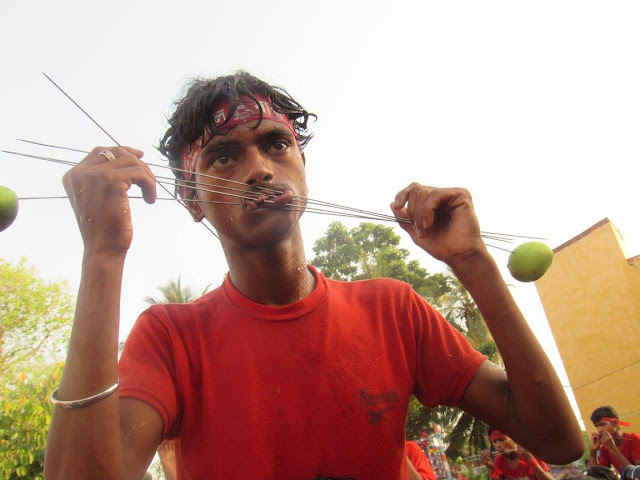 Sometimes in this festival a human "Charak" is made ready to satisfy the Lord Shiva. 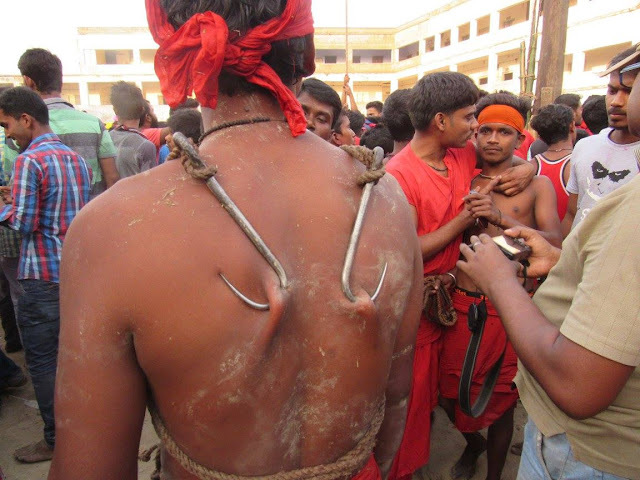 The "Charak" is tied with a hook (Borshi) on his back and then he is moved around a bar with a long rope. Are these guys drugged or severely intoxicated? How do they withstand the pain?